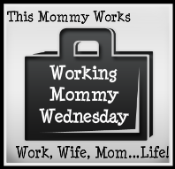 Linking to awesome working mom blogger Julia @ Work, Wife, Mom, Life, this weeks prompt is: Coming home to kids after a 2 week business trip! This post inspired by Julia's because she just returned from a business trip and wrote about the experience of coming home. Her's was exactly as I imagined mine would be - harrowing! I was sure the kids had stored all manner of wild behavior to inflict upon me for the first weekend back - but NO! I was wrong!!! Charlotte was a perfect angel! She was polite and witty. She accompanied me to the store with no incidents (throwing self on floor in doorways, refusal to hold hands, running wildly through store, etc) - none of these things were done! She asked politely for everything she wanted - in all ways it was an exceptional weekend! Sam needed alot of holding - which is hard because he's getting extremely heavy and thankfully he returned to breast feeding with no problems (except at 10pm at night which is suddenly party time). In summary, Mema (grandmother) bootcamp was a brilliant decision. Kids came back better! Before I left weekends were filled with strife, timeouts every 30 minutes for tantrums and objects thrown. I was actually really ready for a break! Maybe they needed a break from me!!! Glad it worked for you. And I hate those 10 pm parties. Happy that your return was peaceful. Grandmas are known for being good for both kids and mothers! i'm jealous!!! :) actually, it wasn't as bad as it probably could've been for me, but i was just sooooo tired... and impatient.